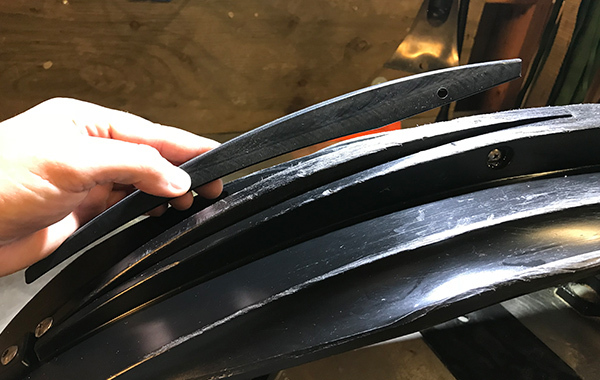 We’ve had success tuning multiple trail chassis with the USI X2 Triple Threat Skis and they are much more durable than it’s predecessor the VX-301. These chassis include Indy, XC, ZX, Apex, and XP. Adjustability has always been a unique feature offered by USI and the X2 Triple Threat continues that tradition. The USI X2 Triple Threat works well on many different chassis. When researching these skis you’ll find that the “Snow Eater Fins” are offered in multiple depths. 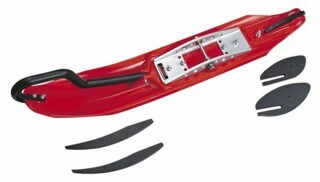 These adjust the aggressiveness of the leading and trailing keel of the ski. They will change the handling in varying conditions. 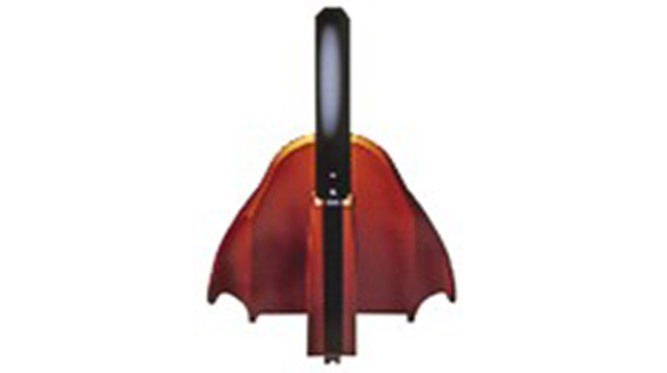 Your decision on your fins can affect your carbide choice. Keep in mind that USI is easy to contact and will help you with your purchase choices. The Snow Eater Fin is available in varying depths. In the past, USI had offered a “Power Steering Plate” that mounted under the ski saddle. Basically, they were different wedge options that would bow the ski to change the curvature. Through development, they found that using a shorter carbide had the same effect and simplified this tuning. 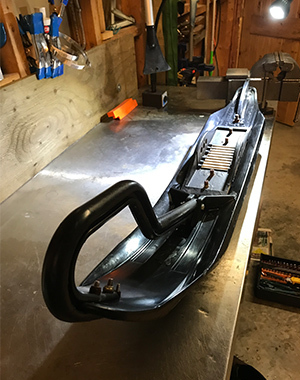 Once you’ve assembled your ski bottom, you’ll find that your carbide attaches your ski bottom to your saddle. The ski-hoop and ski bottom have evolved and are stronger than the original VX/PX?-301. 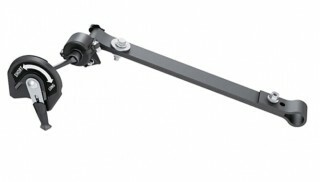 When mounting the saddle to the spindle you have 3 position options for your ski bolt. The purpose of this is to allow more or less carbide in front or behind your spindle. Using the rear hole will give you very aggressive handling and easy steering, and using the front hole you will find the turning characteristics slower and heavier. To date, we generally use the middle option. We have noticed in long-term testing that the outer edges of this wide ski will eventually bow up. 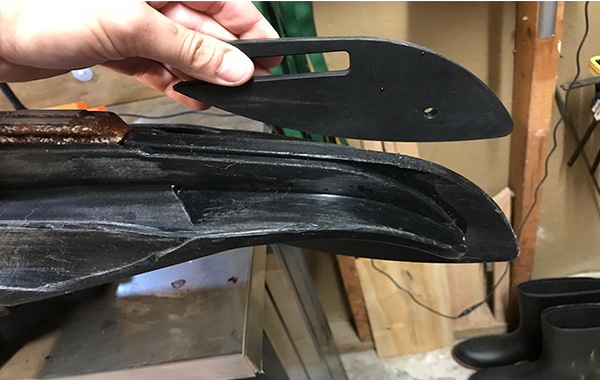 Many plastic skis experience this. When this happens you’ll find it tough to get your saddle/spindle bolt in and out with the ski bottom installed. We remove the carbides nuts first which removes the ski bottom, then access the saddle bolts. By the time this happens it’s time to install some fresh ski bottoms, or heat up them up and flatten them again, or just keep riding. 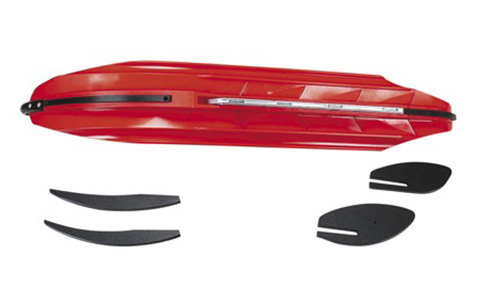 The ski bottom not resembles your modern offshore boat with a “stepped” bottom. The Triple threat utilizes 3 profiles for speed, flotation, and cornering. Skis are often the first upgrade purchase for trail riders. Riding fresh powder on lakes, portages and off-trail is exhilarating, if you can float on top of it. The USI X2 Triple Threat has performed well in all conditions, on many chassis, and is a go-to ski choice for a number of our guest testers. Sorry about the 2 bad photos, we’ll try and get those fixed soon. The information on USI’s website is a bit limited compared to how technical the X2 really is honestly, so we also wanted to share this video that Braaap Films shot with USI in 2012.